Don’t Turn Around didn’t capture me as much as I was hoping it would, but it was still entertaining. There was a bit of mystery to the story. The first couple of chapters were probably my favorite of the story, but they set me up for a bit of disappointment because the remainder of the book failed to keep that mysterious edge, for me. Noa and Peter are both likable characters. I enjoyed Peter’s chapters more, but I liked Noa more as a character. I’m not sure how that works, but it worked in the book’s favor because I didn’t get bored while reading about either of them. The secondary characters felt like strangers to me, even in the end, and I wish they had been explored more. The plot is definitely interesting and I liked the dystopian feeling it gave me from time to time. There is a virus called PEMA that the world is struggling to deal with and I think this has the perfect set up to draw readers in. I only wish there had been more of it, more of the devastation that it has caused, and more of the desperation that drives people to these extremes. In the end I think that was my issue with Don’t Turn Around. I wanted more time to get to know these characters and this world they’re living in, but then the book ends in a slight cliff-hanger, leaving me frustrated. Since it’s a series, I will say I think it’s worth giving a shot. It holds a lot of promise. Thanks for your honest review listing your disappointment, & why. Perhaps because it is a series one is left ham-strung. I like that it holds promise with the exception of that particular dissatisfaction. Yes, thanks for your review, I guess it is a real cliff hanger. But very interesting and a unique idea for a book. 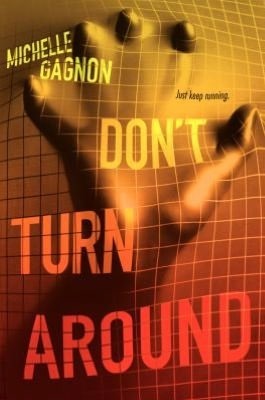 I have read some of Gagnon's earlier works and enjoyed them. Thanks for your honest review. Thanks for the review. It's always good to see honest opinions. I'll still check it out, like you said. It may be worth it as a completed series.